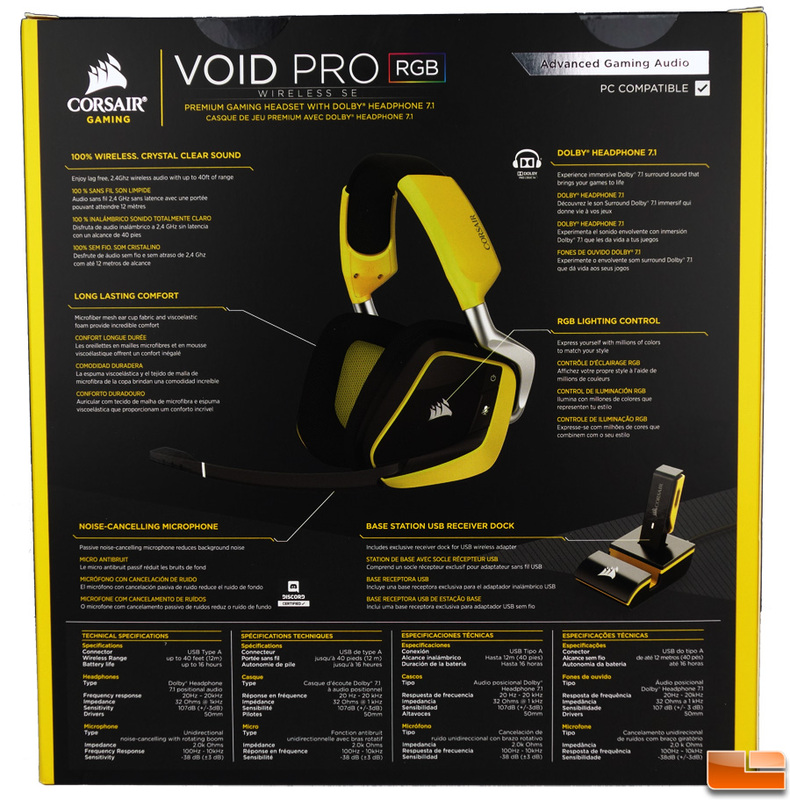 Corsair has put out a number of gaming headsets over the years which have continued to evolve and improve as all products do to remain relevant. The Void line of headsets were well received though faced some stiff competition, especially since the gaming headset market space seems to get ever increasingly crowded these days with no true innovator leading the way at the moment. 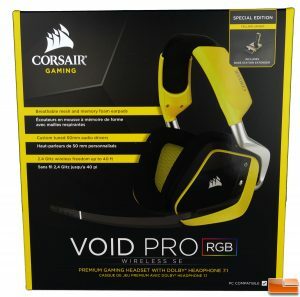 Corsair’s latest premium offering in that category is the Void Pro with Dolby 7.1 surround sound, RGB lighting and wireless connectivity, among other things. It comes in white or carbon (a.k.a. black) finishes, plus as we were fortunate enough to receive, a “yellow jacket’ special edition (SE) version. 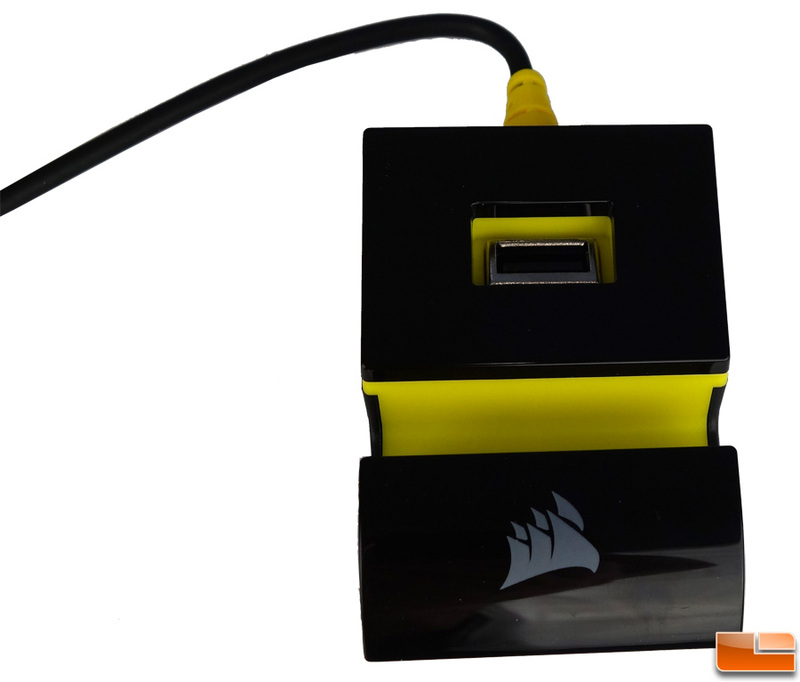 The first two will retail for $99.99 but the SE version will cost an extra $30.00 though in addition to the cool yellow/black color scheme, it also offers a dock for the transmitter so it can be better placed for optimum reception. There are also wired versions, one called the Void Pro USB available in white/carbon and other the Void Pro Surround that will be available in cherry/carbon – each retailing for $79.99. The cable and coloring aside they all look pretty similar which is pretty darn nice which isn’t by accident. They were designed in collaboration with BMW’s DesignWorks studio in California. I think the outcome worked rather well in that regard and the specs grid a little farther down the page will give you the necessary details for each. The high-quality audio comes from custom-tuned 50mm neodymium speaker drives that boast a frequency response of 20Hz – 20kHz with an impedance of 32 Ohms @ 1kHz. What all of this means is a broad frequency range covering booming lows and ringing highs in Dolby 7.1 surround for your aural pleasure. The unidirectional microphone is similarly equipped with high quality specifications including a frequency response of 1000Hz – 10kHz with noise cancelling ability so that being heard clearly in the heat of battle is not an issue. Overall, the headset weighs in at 390 grams, somewhat hefty in comparison to others partly due to the integrated lighting and wireless electronics though not too bulky at 228mm(L) x 242mm(W) x 108mm(H). 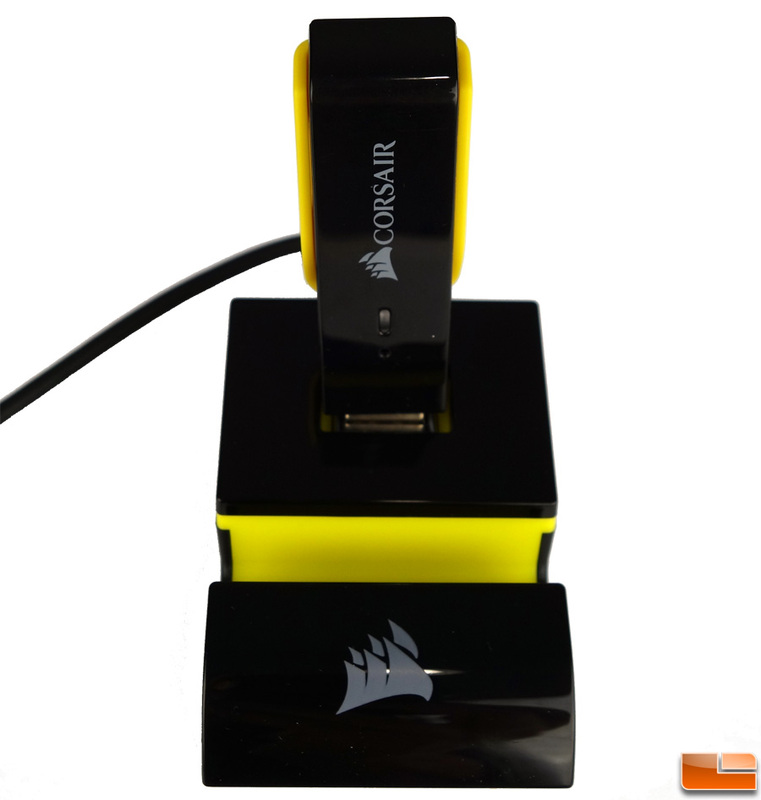 The wireless signal works at 2.4 GHz and has a rated range of 40ft and according to Corsair, will last for a good 16 hours before needing a recharge. If you game longer than that, other than needing professional help, you can also use them while connected to the ~80″ USB cable. Ultimate Comfort: Breathable Microfiber mesh ear cup fabric and new viscoelastic foam provide hours of comfort while reducing heat build-up and moisture. 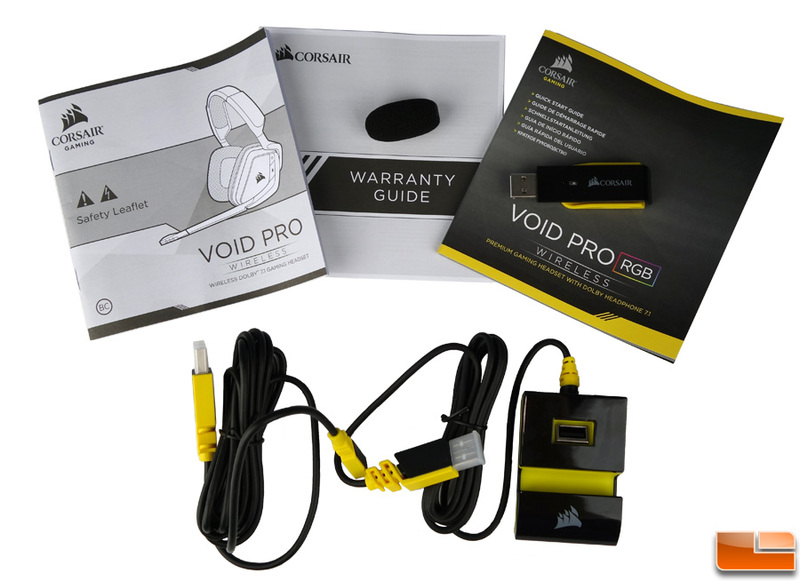 Premium Build Quality: Legendary CORSAIR construction and quality, including metal cantilevered yokes and headband inserts ensure long term durability that outlasts the competition. Precision Gaming Audio: Custom-tuned 50mm neodymium speaker drivers bring the action to life with brilliant range and accuracy. Superior Wireless Performance: Enjoy low latency, 2.4GHZ wireless audio with improved range up to 40ft over 16 hours of battery life. Newly developed diversity antennas enhance coverage and improve performance even in the most demanding conditions. Sidetone Control: Hear yourself when you speak into the microphone and avoid shouting. Epic Surround Sound: Genuine Dolby Headphone 7.1 surround delivers immersive multi-channel positional audio that puts you in the middle of all the action. RGB lighting: Express yourself with virtually unlimited color options and sync with other CORSAIR RGB devices. CUE Control: CORSAIR’s exclusive CUE software gives you full control over your headset’s features through an intuitive and simple to use interface. 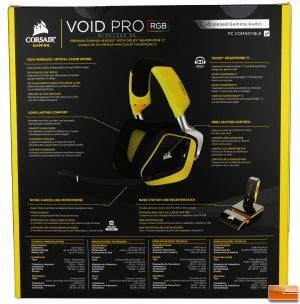 In the package of the yellow jacket SE version we have a number of items outside of the headset itself. There’s a safety leaflet, warranty guide, instruction booklet, a USB to micro-USB cable for charging the headset, a USB thumb drive type wireless transmitter, and a wired dock for the transmitter to plug into. 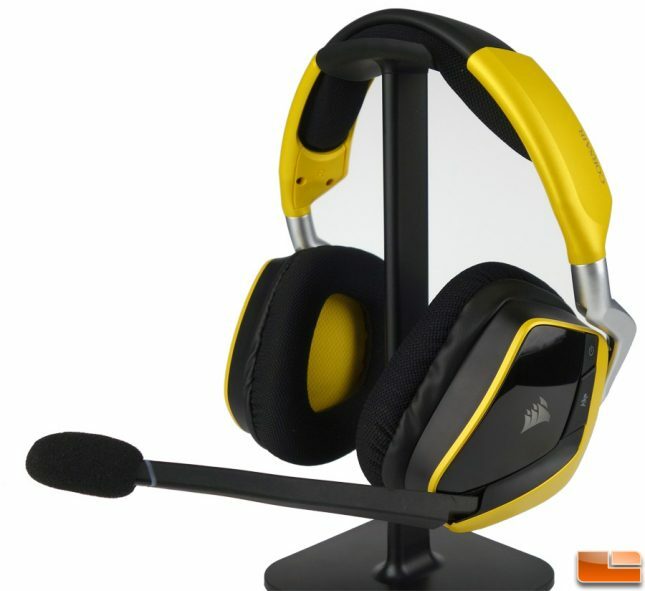 All follow the same yellow/black scheme of the headset itself. It simply plugs into the dock which has a roughly 5ft cord to help place the transmitter in the best position possible for a strong signal, sans interference.